For most Americans, probably, it remains the quintessential Civil War battle. Antietam/Sharpsburg may have been America’s bloodiest day. Some historians argue with great cogency that Vicksburg was more decisive. But that was not how the men in blue and butternut and gray, clogging the roads that led to a town called Gettysburg, Pennsylvania, saw it. They knew, many of them—felt it in their bones and in their souls—that they were moving toward the mother of all battles, the one that would decide everything. Given that mindset, it was inevitable that the Battle of Gettysburg would generate in its aftermath a great wave of books and articles, history and personal memoirs. Even today, the river of ink about Gettysburg continues without apparent letup. But can any of these newer books, written so long after the event they claim to commemorate, add anything to our understanding of that event? Here’s one that can. 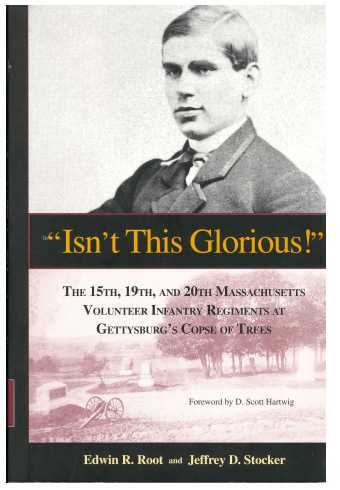 The book is “Isn’t This Glorious!” The 15th, 19th and 20th Massachusetts Infantry Regiments at Gettysburg’s Copse of Trees. It is by historians and long-time preservationists Edwin R. Root and Jeffrey D. Stocker, with a Foreword by Gettysburg historian, D. Scott Hartwig. What Root’s and Stocker’s work has to offer that is new to an understanding of the mythic battle is an appreciation of how that battle actually was fought—at least, in a key section of the field, the famed Copse of Trees where the Confederacy crested on July 3, 1863, after the breathtaking demonstration of doomed energy and devotion that we know as Pickett’s Charge. As their book points out, the Union troops at the Copse of Trees had no way of knowing that Confederate Brigadier General Lewis Armistead’s final thrust marked the beginning of the end for the Confederacy. They fought back as if their whole cause was on the line, because for them it was. And many died repelling this “last gasp” of the South. “Isn’t This Glorious!” is not a regimental history of the units whose service there is commemorated by the book. Instead, it is an attempt to do justice to those units. And the reason justice is needed is that the “monumentation” process after the war, the business of determining who gets what plaque or monument, went somewhat askew here at the Copse of Trees. The Massachusetts regiments were not left out; but the final placement of the monuments was such that visitors, unaided, could not accurately interpret what had happened at this point on the battlefield. The book’s co-author, Edwin Root, commented that he doubted the monumentation as it stands was deliberately designed to be hurtful to the Massachusetts regiments. He also said it is not his and his co-author Jeffrey Stocker’s intent to try to get the on-site monuments’ locations changed. They do hope their book will be helpful in clarifying the confused scene at the Copse of Trees for its readers. While the book documents the monumentation controversy in detail, that is not what makes it most interesting. The interest is created at the beginning, when we are present at the formation of the 15th, 19th and 20th Massachusetts regiments and view the subsequent history of these men—clerks, carpenters, students, seamen, and more—as brothers-in-arms. They never become an undifferentiated mass. We follow them to their individual fates, as they survive unscathed, are wounded and sent home, or die in the various hideous ways war makes inevitable. We see the effects their wounds or death have on them and on their families, down through dreary decades. We are reminded again that war is not kind. “Isn’t This Glorious!” is the initial publication of Moon Trail Books, of Bethlehem, Pennsylvania, Patricia N. McAndrew, publisher. With its hard cover, fine paper, sewn binding, maps by Richard Jacoby, and its overall design by graphic artist Kenneth F. Raniere, the work would be a tempting buy even for those who don’t care about the Civil War, but who just love beautiful books.